Hello lover, I just dropped by to tell you that in case you were wondering what to make for lunch this week or prepare quickly in the evening, here is the recipe you have been looking for! It is especially designed for these late summer days when the sun is still nicely warming our noses but you can already feel that the chill of fall is on it’s way. The recipe is super simple, it’s quick to prepare, takes less than 15 minutes and the ingredient list is nicely minimalistic. So it has exactly those features that an excellent everyday food should always have. And it of course tastes heavenly. It is a spinach soup with a twist. 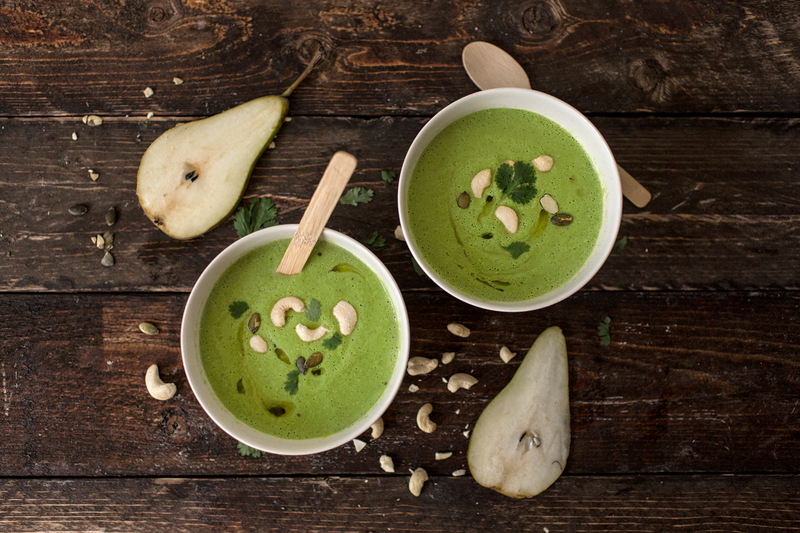 The soup is made of ripe, juicy pears and fresh spinach leaves accompanied with coconut milk and a nice bunch of fresh herbs, coriander and parsley. I’m loving how it is creamy and smooth, fresh and earthy, all at the same time. I couldn’t wish for better elements from my power soup. I hope you’ll find it is a perfect match for your late August days too! Peel onion and pears and cut to pieces. Add a little bit of olive oil to a pan, add onions and pears cubes and sauté for a couple on minutes. Add coconut milk, water, vegtable broth cube, spinach leaves, parsley, coriander and cook for 5 minutes. Pour the mixture into a blender and blend until smooth. 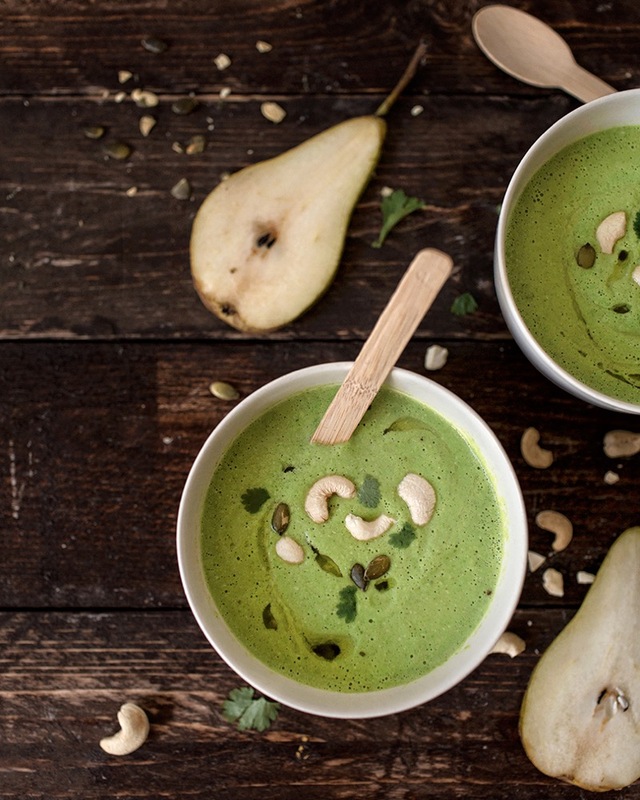 Pour in bowls, add a drop of olive oil and sprinkle some cashews and seeds on top. Serve and enjoy! Tip! For extra creaminess, add ½ cup to the soup mixture cashews while cooking! lovely late summer to you too Jessie, and loots of love and sunshine!